Bathroom lighting design makes its own statement and goes beyond the simple act of illuminating an area. It considers the needs and wants of the people using the room and then adds a touch of magic to make the most of the architecture and layout too. Lighting is a key aspect of any home decoration project and no less so in your bathroom decoration. 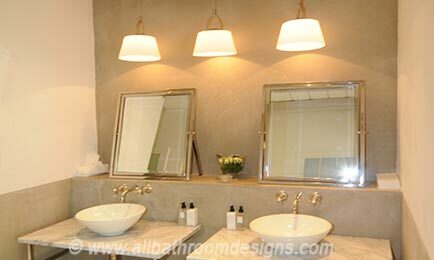 Designer bathroom lighting is a homogeneous mixture of various lighting techniques, fixtures, and placements and pushes the mindset as far as lighting is concerned. Avoid chances of back-splash when using lights not specifically designed for bathrooms. All light fixtures must be fixed at standard heights or in such a manner that they are protected from water and moisture. Make sure your lighting layout plan takes care of this important detail. A competent lighting supplier can assist you with advice! 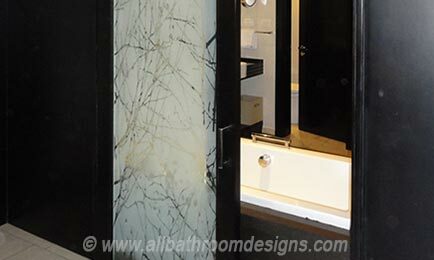 An emerging design concept in today's modern bathrooms is the use of innovative bathroom light fixtures and techniques to produce effects that reflects your individual taste - whether quirky or traditional or anything in between. So let's understand how these advanced lighting systems for the bathrooms work. The single most important rule of thumb when modernizing your bathroom - using the latest lighting fixtures and techniques - is to ensure coordination of form and function. Your bathroom has two major roles to play – hygiene and grooming. 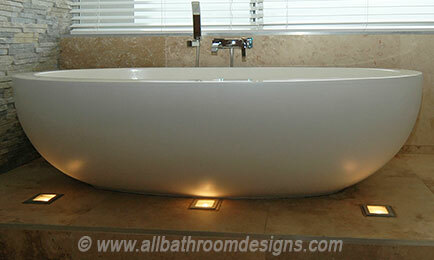 Modern bath lights need to be able to facilitate these for you. Create layers of lighting so that you will not be dependent on a single source of light (like a ceiling or wall light) to drive away the darkness from your bathroom and complete the necessary tasks. Play around with various materials and styles for contemporary bathroom lighting to avoid monotony and create a mosaic of interesting patterns and motifs. Choose the lighting first and then look for the bulbs that would fit the lighting fixture. Not the other way around. Most contemporary bathroom lighting fixtures use LEDs, CFLs and other low energy sources for lighting up your bath. Just the simple task of replacing old bulbs with modern day energy saving bulbs can help you save a substantial amount of money! We love how this window turned into a dramatic design element as well as being a light source. 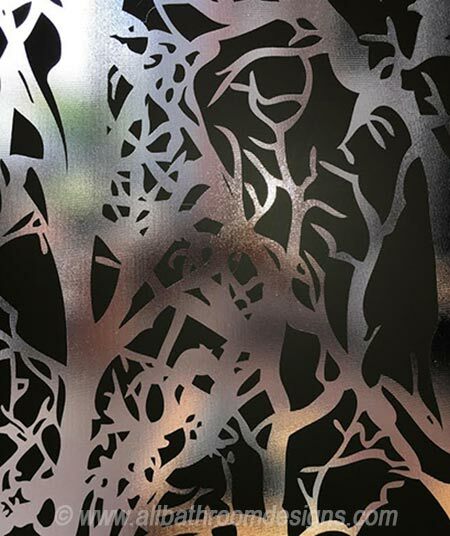 If you look up close you can see how a vinyl decal was used on metal mesh glass to create this stunning effect. Designer bathroom lights in the shower/tub area must be bright to prevent accidents from slipping etc., especially in bathrooms for the elderly. If you enjoy long soaks, recessed task lights can be beneficial, as they'll keep the glare away. Aim the beam of light to fall just outside the edge of your bathtub. When it comes to mirror lighting, take a look at vertical wall sconces. Known for their ability to provide ambient illumination and getting rid of shadows, sconces in their designer avatars are quite eye-catching as well. 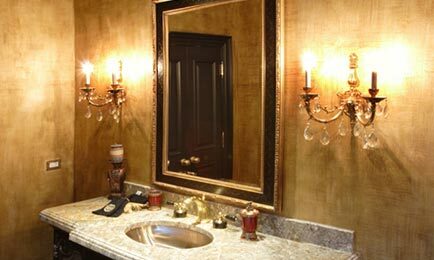 Add more power to the vanity and mirror ensemble by fixing a halogen light on top of the vanity to create cross-lighting along with the mirror wall sconces. Spending time in a glimmering and glowing bathroom at night is a wonderfully relaxing experience. Achieve this by lighting up the floor or adding LED strip lighting under counters, above cabinets or behind mirrors. 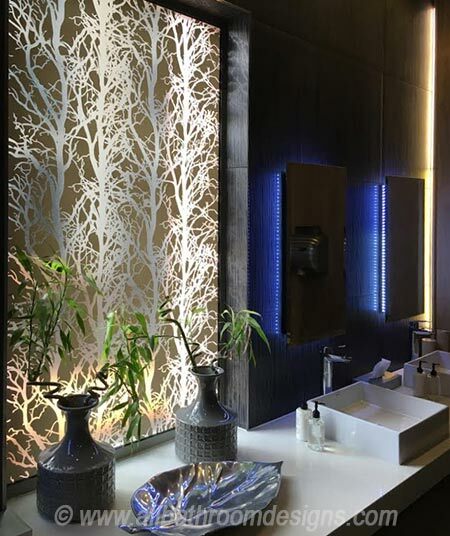 Cove (indirect) lighting – a delightful concealed source of light – adds a soft, rich glow to your bathroom. 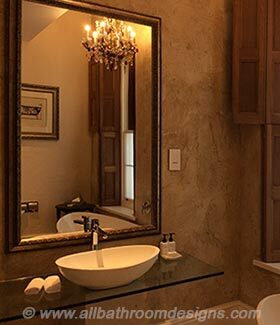 From placing beautiful and unique table lamps on bathroom tables, vanities, or cabinets to suspending a marvelous ceiling light, you can create a warm, elegant, and glamorous atmosphere in your bathroom, whilst also brightening the space. More important than an exquisite bathroom light... is making sure it is suitable for a bathroom, because to this day electricity and water do not mix well. It does not mean that you can't use a heirloom chandelier in your bathroom! If you can place it far enough away from a tub or shower, it can be perfectly safe to use. If in doubt...!! You must consult with a professional if you have any doubt about a light being compliant with your building codes. A well-lit bathroom at all hours offers a safe space for the elderly and small children. Providing adequate light during the night (when they need to visit the WC half asleep) warrants special consideration. You don't need the same level of illumination as for grooming tasks. You could look at dimmed lights that can stay on throughout the night, or motion-sensored night lights to guide their way. Contemporary bathroom lighting design is a combination of art and science, moving beyond the utilitarian mindset. 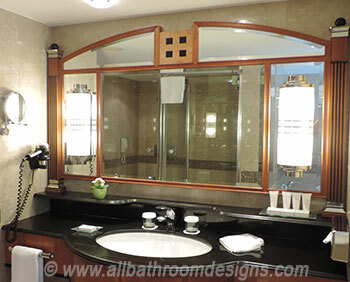 Earlier bathroom layouts relied on lighting fixtures and electrical fans to deal with the lack of illumination (even during the day) and natural ventilation. Today we understand the importance of natural light and offer bathroom lighting ideas to help you when you design your own bathroom - either from scratch or when remodeling a bathroom. 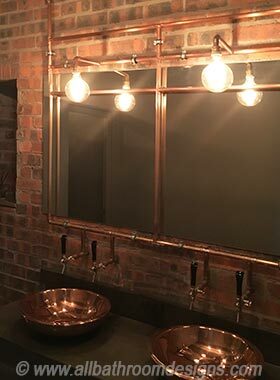 Bathroom lighting design is an integral part of bathroom decorating and more than any other element sets the mood of the room.